In the heart of Cocoa Beach lies quite possibly one of the best restaurants on Florida’s Space Coast – Florida’s Fresh Grill. Located in the Banana River Square off A1A, Florida’s Fresh Grill opened in June 2013 by owners, Bill and Susan, a husband and wife team. They’ve built a reputation in the community of serving fresh food made from scratch and offers exceptional service in a warm atmosphere that includes both indoor and outdoor seating. As I walked in the front door I received a genuine, friendly greeting and made my way to the bar to meet my wife and friend. Upon sitting down, the bartender greeted me by name and presented me the menu. Bartenders Jacob, Tina and Shelly go beyond the call of duty to make you feel right at home. They’re attentive, efficient and friendly; on my second visit, I was greeted by name as I sat at the bar and every time since then. Dare I say it’s like being on an episode of Cheers? My journey began with their fresh, Florida style fried calamari and Florida Beer Company’s Gaspar porter on tap. I admit, I’m not usually a fan of fried food but to describe this in one word it would be, “scrumptious.” Made to order, the calamari is lightly tossed in seasoned flour along with strips of bell peppers, then fried to a perfect golden brown and served with a side of their unique pepperoncini aioli and a traditional marinara sauce. 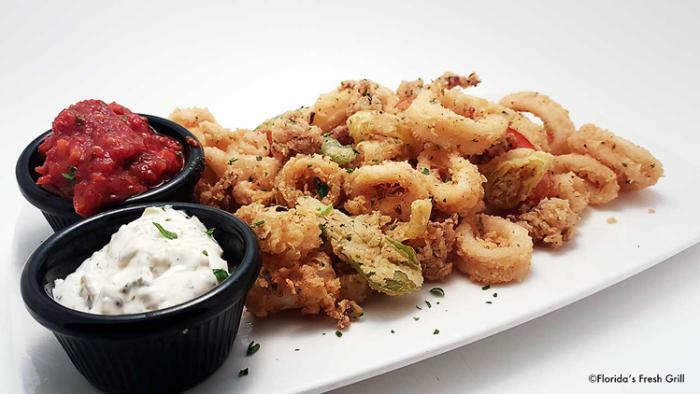 The calamari was tender and flavorful, and dipped in the pepperoncini aioli is definitely the way to go. This flavor profile paired up just right with the roasted characteristic of my porter. I took in the positive energy of the restaurant between my appetizer and entrée. The atmosphere is comfortable and elegant without being pretentious. They have trained their staff well because the staff works in harmony, which of course leads to a great service. Of note, my appetizer came out in less than 10 minutes and my entrée was served very quickly after I finished my appetizer. Honestly, the best service I’ve experienced on Florida’s Space Coast. For my entrée I ordered Blackened Atlantic Swordfish topped with jalapeño bacon cream sauce, rice pilaf and maple butternut squash gratin. 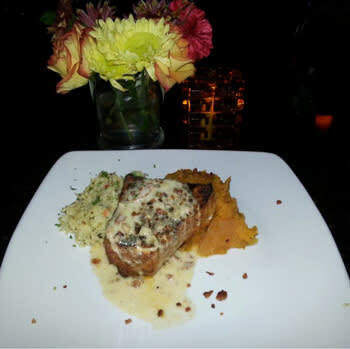 The succulent two inch swordfish steak was perfectly grilled, moist and melted in my mouth as the jalapeño bacon cream sauce excited my taste buds. The butternut squash was not overly sweet and was the right complement to this entrée. A perfect ending to this wonderful meal was the Pumpkin Crunch Cake, a seasonal dessert. This was a homemade pumpkin cake, with homemade salted caramel, and homemade whip cream. The only bad thing about my dining experience was that it had to end. But I will be back…over and over again. Florida’s Fresh Grill is open seven days a week from 5-10 p.m. Happy hour is from 5-6 p.m. Monday – Friday, and 5-7 p.m. at the bar. Due to its popularity, reservations are recommended.